A well-grounded survey of the incredible courage of Chinese artists since the first flowering of the late 1970s and subsequent crackdowns. O’Dea, an Australian journalist who has traveled to and lived in China during the past three decades and founded ArtInfo China, first befriended Chinese artists in the late 1980s and followed their tumultuous trajectory during the years since. Here, she chronicles the lives of nine people, moving from China’s “great experiment in ‘opening up and reform’ ” in 1986, when the rehabilitated leader Deng Xiaoping, courted by the U.S. since meeting Jimmy Carter in 1979, first embarked on liberalizing reforms and artists embraced the whiff of freedom, through the tragedy of the crackdown after the Tiananmen Square revolution of 1989 and to the present embrace of forgetting and economic pragmatism. Before there was 1989, O’Dea reminds us, there was 1976, when an earlier drive for democratic action erupted in Tiananmen Square after the death of Mao Zedong, the earthquake of Tangshan, and the public mourning of the death of Premier Zhou Enlai. Many of the artists who exploded in personal expression in 1976 had been teenage Red Guards in the Cultural Revolution who were inculcated in stamping out “bourgeois liberalism” and terrorizing their teachers. Artists like Huang Rui and Mang Ke, as well as the artists calling themselves the “Stars,” created a newsletter that was eventually shut down by Deng’s regime. The author also looks at the effects of the Sino-Vietnamese War—not often discussed in China—and the “very heaven” conditions that fostered artistic freedom in the 1980s, as people began to pull themselves out of poverty. Like the death of Zhou in 1976, the death of reformer Hu Yaobang in April 1989 sparked widespread demonstrations, and the political consequences were dire, creating essentially another generation of forgetting. 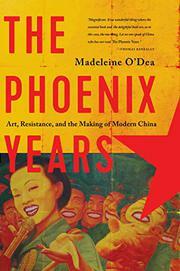 An illuminating chronicle of several generations of resilient and beleaguered Chinese artists, with minibiographies, a helpful timeline, and extensive notes.